Any parent of a 3 year old knows that in the summertime, popsicles are the ultimate treat. They are cold, for one, which is always a plus in the kind of heat we’ve been having. Sweet tends to rank highly for most three year olds I know as well. And best of all, they are messy. Gloriously, drippily, creamily messy. But the dayglo colors and artificial flavors in most supermarket popsicles do not appeal to adults. We like our treats a little more decadent, a little more sophisticated. Something creamy, with subtle, sweet flavors. But we still like the fun of a frozen treat on a stick. 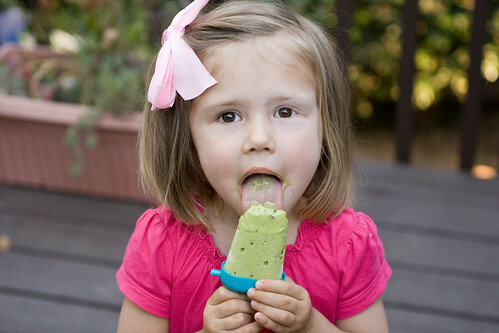 These avocado mint ice cream pops please both the kids and the adults. They check the boxes of sweet, cold and messy, but they’re also outrageously creamy and they have a flavor that you can’t quite place. The perfect cold and creamy treat for the steamy hot days of summer. In a small food processor or blender, whizz the mint leaves a few times to chop. Remove the pits from the avocado, scoop out the flesh from the skins. Add to the food processor the avocado flesh, the condensed milk and the lime juice and blend until creamy. 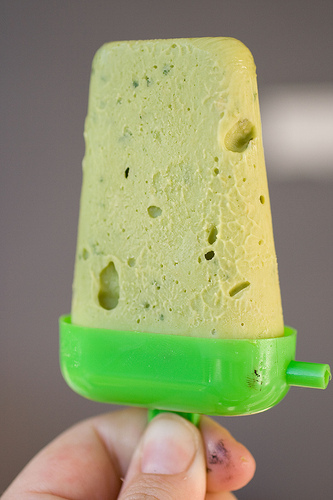 Pour the avocado mixture into 4 popsicle molds and freeze until firm. Eat quickly or with a lot of napkins. What a gorgeous addition of the mint! I’ve had avocado ice cream in Asia, but never with mint. I love this. Nb, have only just stumbled on your blog and have had the loveliest time with a cup of tea trawling through the archives- thank you! I keep eyeing a Zoku, but who has the freezer space? I want a plug in popsicle maker.